Oakland University will host former Secretary of State Madeleine Albright as part of the Varner Vitality Series on Tuesday, Oct. 14 at 7 p.m. in the O’rena. The event is sponsored by the Student Life Lecture Board and Academic Affairs. Albright was nominated for Secretary of State by President Bill Clinton and unanimously confirmed by the United States Senate. Albright was the first female Secretary of State and at the time, the highest ranking woman in the history of the United States government. Albright’s previous credentials include United States Permanent Representative to the United Nations, member of Clinton’s Cabinet and member of the National Security Council and White House staff member. She also serves as president for the Center for National Policy, a research professor of international affairs and director of Women in Foreign Service program at Georgetown University. Albright was a Woodrow Wilson fellow at the International Center for Scholars at the Smithsonian and served as a senior fellow at the Center for Strategic and International Studies, researching developments and trends in the Soviet Union and Eastern Europe. 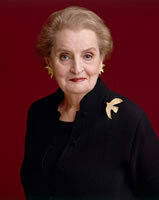 Albright has a Bachelor of Arts in Political Science from Wellesley College, a certificate from the Russian Institute at Columbia University and both a master’s and doctorate from Columbia University’s Department of Public Law and Government. While at Oakland University, Albright will meet with student leaders, faculty, staff and event sponsors, conduct a public lecture and participate in a private book signing. The lecture will begin at 7 p.m. in the O’rena. Doors open at 6 p.m., and shuttles will begin running from OU parking lots at 5:30 p.m.
Tickets are available from the Center for Student Activities Service Window, 49 Oakland Center, and Ticketmaster outlets. Tickets are free for current Oakland University students, faculty and staff (only available at the CSA Service Window) and $20 for the general public. Tickets will also be available at the door if not sold out prior to the lecture. Tickets at the door may only be purchased with cash or check. No credit cards can be accepted at the door. For more information, contact the Center for Student Activities at (248) 370-2400. Summary Oakland University will host former Secretary of State Madeleine Albright as part of the Varner Vitality Series on Tuesday, Oct. 14 at 7 p.m. in the O’rena. The event is sponsored by the Student Life Lecture Board and Academic Affairs. Albright was nominated for Secretary of State by President Bill Clinton and unanimously confirmed by the United States Senate. Albright was the first female Secretary of State and at the time, the highest ranking woman in the history of the United States government. Albright’s previous credentials include United States Permanent Representative to the United Nations, member of Clinton’s Cabinet and member of the National Security Council and White House staff member. She also serves as president for the Center for National Policy, a research professor of international affairs and director of Women in Foreign Service program at Georgetown University. Tickets are free for current Oakland University students, faculty and staff and $20 for the general public.